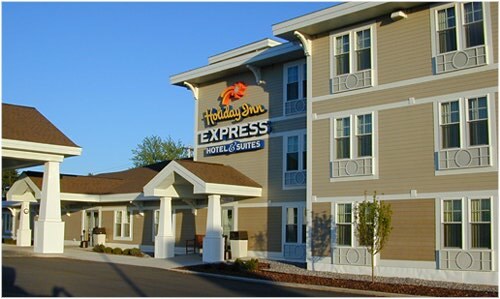 Surrounded by Iron Mountain’s amazing backdrop of green forest and water, Holiday Inn Express & Suites hotel offers immaculate accommodations full of comforts for business travelers and families on vacation. All of our tastefully-appointed rooms and suites offer contemporary décor and our signature lifestyle amenities. Each room offers a 32″ LCD color TV, free cable including HBO, air conditioning, free local calls, direct dial phones w/data ports, speaker & voicemail, free high-speed wireless internet, AM/FM clock/radio, coffee maker, hairdryer, iron and board and a work desk with lamp and ergonomic chair, complimentary Wi-Fi internet access, and luxurious plush bedding with your choice of soft or firm pillows. Fitness Center at Iron Mountain, MI Holiday Inn Express & Suites Stay with us and experience the perfect blend of style and service with our thoughtfully designed Holiday Inn Express & Suites of Iron Mountain. Whether you are planning an extended stay or a quick getaway, our beautiful hotel provides the ideal place to enjoy a long weekend or to unwind after a busy day of work. All amenities are completely guest-oriented and designed to keep everyone comfortable, no matter how long their stay. Our impressive array of enhanced extras includes complimentary hot breakfast, indoor heated pool, complimentary Wi-Fi and local calling, fitness center, and meeting room. Complimentary Express Start Breakfast – Wake up to a great start at the Iron Mountain Holiday Inn Express & Suites! Savor an expanded buffet of hot breakfast items that includes gourmet coffees and teas, an array of cereals, muffins, fresh whole fruit, toast, fresh fruit juices, pancakes, meats, and our famous Cinnamon Rolls. The Antoine Banquet Room – Has everything you need to host a successful seminar, company meeting, wedding reception or informal gathering, no matter the size. Conveniently located adjacent to the Iron Mountain Holiday Inn Express & Suites. Reservations for the Antoine room can be made by calling (906) 774-5166. Take Care of Business with Our Executive Extras – Whether you’re in town for business or hosting a meeting at the hotel, we offer a comprehensive array of amenities designed to help you get business done. Same Day Dry Cleaning Services, Meeting Room; including Audio Visual Equipment, and a Business Center; offering a PC, Wired Internet Service, Printer, Copy Machine and Facsimile. Below are the latest postings from Holiday Inn Express & Suites On Facebook.